Let’s face it, there are a lot of movies about weird people wandering around LA. It makes the shooting schedule much simpler. And we are a weird people. Don’t believe me? There is a long tradition of these cheapo quirkfests: 2 Days in the Valley, Down in the Valley, Harsh Times, More Dogs than Bones, LA Story, The Wonderful Ice Cream Suit, and True Romance roll off the top of my head. Some of them are considered classics, some are hidden gems, and some are downright awful. What strikes me as peculiar about Seven Psychopaths is its comfort in this company. Rather than separate itself from the pack, the film jumps in headfirst. And it is whilst bumping heads with its predecessors that a few newfangled sparks arise from this well worn premise. There are some rules to making this type of movie. Because the sets are typically on location, the scenes live or die on the strength of their scripts first and their actors second. Tarantino’s minimalist Reservoir Dogs, while not fitting the template of the above films, strove to entertain entirely on character interaction and conversation. A slew of direct-to-video schlockfests in the ’90s thought they could ape Tarantino’s animus with predictably minimal returns. Intriguingly, the opening dialogue of Seven Psychopaths between two mobsters (Michael Pitt and Michael Stuhlbarg) about gunshot wounds to the eye evokes Tarantino’s rambling patter, and as it reaches its apogee, both are shot dead by our first psychopath. This is the first clue that Writer-Director Martin McDonagh may have prepared a little more pepper to go with our customary fingers of Scotch. 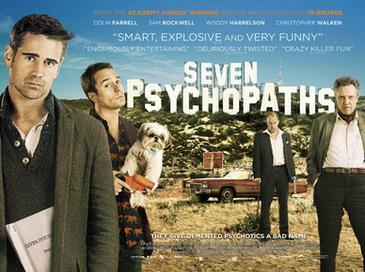 Seven Psychopaths is an LA movie raised on LA movies. It concerns the plight of potentially alcoholic writer Martin Faranan (Colin Farrell), a man whose script is still “under development.” As Roger Ebert says, this means the writer has a title and nothing else. Marty’s best friend is named Billy Bickle (who indeed shares the last name of De Niro’s famously psychopathic taxi driver), a struggling actor and part-time dog thief played by Sam Rockwell. Billy’s partner in crime is an old, mellow gentleman named Hans Kieslowski (Christopher Walken), who is in the dognapping business to pay for his wife’s cancer treatment. Hans and Billy’s business gets them into trouble when they mistakenly purloin Bonny, the personal Shih Tzu of cantankerous gangster Charlie Costello (Woody Harrelson). Charlie will stop at nothing to get his dog back, and he chases Hans and Billy across the city, a pursuit that soon envelopes Marty, who is still desperately trying to write his story, “Seven Psychopaths,” without the stereotypical conventions of revenge, murder and mayhem. This movie could have been a mess, but because it treads on ground so often trod before, McDonagh deconstructs the premise as much as he can. It must be an ensemble piece. These types of films always are. The plot alone is usually not enough to carry a full feature so the movie is broken up into episodes, asides and detours, carted to and fro on the backs of its characters. And the cast of this one is especially good. The standouts are Christopher Walken and Sam Rockwell. Rockwell regularly turns in first class performances but his Billy Bickle is given a range of troubling hangups to work through. Rather than saddle Billy with the aviator-hat-wearing Johnny Knoxville role, he is a vulnerable, broken manchild, with his heart in the right place and not enough screws to keep it together. Walken, on the other hand (who plays briefly and beautifully off of Linda Bright Clay, giving a brief, beautiful performance of her own), shares a nuanced relationship with the screen that makes every minute with him a magnetic meditation. Walken has always been a fan favorite, and the first to poke fun at himself. It shouldn’t be surprising that the Academy award winning actor inhabits this role so well, but he hardly seems to be acting at all, just enjoying the weave of McDonagh’s shrifts. Colin Farrell and Woody Harrelson also give great performances, the former in a much more meek and mild role than he’s been given before and the latter with a kooky malice he’s pitch perfect at. Seven Psychopaths stays fun from beginning to end, even when stopping the plot to delve into Marty’s screenwriting ideas. There isn’t much plot to stop and most of the diversions fit, to varying degrees of success, the themes of this compact picture. Tom Waits’ Zachariah character really serves as little more than an intermission in the action, something that would have been cut from a theatrical run. But he’s in here, and he’s a treat. That may very well be the philosophy at work behind this somewhat metafictional film: A series of candies scattered amongst the drama. McDonagh can’t reinvent the wheel, so he taps deeper into what surrounds its invention. He lets us watch characters that talk, and characters that decide, and lets us laugh at some very comfortable performances that grow naturally from the two. Like California itself, like movies in general, it’s a scenic drive. Tom Waits was especially good however in the scene just before the full reel of credits and that sold Colin Farrell for me. Sam Rockwell’s take on a shoot out was spectacular! That stinger scene is interesting in that it sort of retcons the upbeat last scene of the movie proper. At the end, Farrell finishes his screenplay and walks down the street, sort of triumphant, but by the time Tom Waits calls him and the movie’s been out, he looks miserable. McDonagh kind of gave us two endings: the Hollywood one and the more personal, realistic one.